If you knew a dark secret about a friend’s past, would you tell his or her significant other? In 2004, 47-year-old Carl “Charlie” Brandt murdered his wife, Teri, and her niece, Michelle, before hanging himself. But what most of his friends and family didn’t know at the time was that Brandt had killed before. When Brandt was 13, he shot and killed his pregnant mother, shot his father — who survived — and attempted to shoot his sister, Angela, who escaped. Brandt was not charged but was placed in a psychiatric facility. After he was released one year later, his family packed up and moved out of state, where no one knew about his past. Members of Teri and Michelle’s family join Dr. Phil in search of answers. Who knew about Brandt’s history, and why didn’t they come forward? Brandt’s ex-brother-in-law, Jim, joins the conversation and admits he knew about Brandt’s dark past when he introduced him to Teri. Why does he say he kept the secret from her? And, what red flags does he admit he missed? Plus, authorities say unsolved murders may be connected to Brandt. Was he a serial killer all along? Then, in 2013, the body of missing 18-month-old Elaina was found in a box in a garage. Her mother, Angela Steinfurth, and Angela’s then-boyfriend, Steven King, were convicted of murder and sentenced to life in prison with eligibility of parole in 18 and 25 years, respectively. What do they claim caused baby Elaina’s death? Angela’s half-sister, Mary, and Elaina’s father, Terry, say they are struggling to come to terms with the tragedy and want to know how they should approach the subject with Elaina’s 4-year-old sister. How can the family move forward after such a devastating loss? Plus, Dr. Phil checks in with former guest, April, who was battling an eating disorder and the end of her marriage. How is she now? 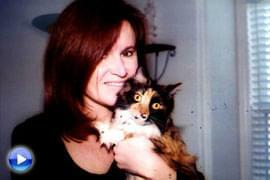 In 2004, 47-year-old Carl “Charlie” Brandt murdered his wife, Teri, and her niece, Michelle, before hanging himself. But what most of his friends and family didn’t know at the time was that Brandt had murdered before. Bill and Mary Lou, the parents of Michelle Jones, one of Charlie Brandt’s victims, explain what they learned about Brandt’s history — after it was too late for their daughter. On September 13, 2004, Brandt killed again. “She wouldn’t have stayed with him,” Bill says. Jim was married to Brandt’s sister, Angela. He shares how he found out about Brandt’s deadly past, and what he did with that knowledge. Also, were there any warning signs that Jim may have missed? “I met Charlie Brandt’s sister, Angela, when I was 16,” Jim says. “We got married about 18 months later. Angela told me about Charlie’s past before we got married. She goes, ‘I have something I have to tell you. My brother killed my mother.’ I wasn’t quite prepared for that at all. I didn’t believe it. One day, we went over to Angela’s father’s house, and he was mowing the yard without his shirt on, and he had these scars. There was no mistaking it was a bullet hole, and now I am aghast. She was telling me the truth. Now, all kinds of things are racing through my mind — and she had said it more than once — that she was still frightened of him at times. “After Angie and I split, Charlie and I actually became closer. Somehow we got on the topic of revenge. He looks at me and goes, ‘Well, you know what the perfect revenge is, Jim … You kill somebody, and then you cut their heart out, and you eat it.’ I didn’t know what to say. I was dating a girl named Nancy, and Charlie had inquired if she had any friends that she thought would be interested in palling around with all of us. Teri was Nancy’s friend. Charlie and Teri hit it off and started dating. After six months, Charlie expressed to me he was going to ask Teri to marry him. I told him, ‘You have to tell her about your past.’ Charlie told me that he told her about his past. Bill and Mary Lou speak to Jim for the first time to ask him why he didn’t tell Teri about Brandt’s past. Dr. Phil notes that Teri’s story of seeing Brandt covered in blood in the laundry room was the same day a woman was murdered in their area. “After the murders, there were a number of inquiries from law enforcement agencies around the country,” Mary Lou says. “And our Teri and Michelle would still be alive with us today,” Mary Lou says. Debbie and Peggy were two of Michelle’s best friends. It was Debbie who got the call from Mary Lou to check on Michelle and found Brandt hanging in the garage. They join the discussion via satellite in front of the house where Michelle and Teri were found. Did Debbie foil Brandt’s plan to kill the night before the murders took place? “Tell me about these journal entries that were written,” Dr. Phil says to Mary Lou. “I did see the journal entries. The entries that I recall seeing described evenings where Charlie had an emotional day or Charlie was very emotional,” Mary Lou says. “Nothing that was any clear indication that she knew. We won’t ever know, but in my heart, I don’t believe my sister would’ve stayed with someone who committed a violent crime like that,” Mary Lou says. What would Dr. Phil have done if he knew a friend’s dark secret? The book, Invisible Killer: The Monster behind the Mask by Diana Montane and Sean Robbins is in bookstores now. In 2013, the body of missing 18-month-old Elaina was found in a box in a garage. Her mother, Angela Steinfurth, and her then-boyfriend, Steven King, were convicted of murder and sentenced to life in prison with eligibility of parole in 18 and 25 years, respectively. Steinfurth’s half-sister, Mary, and Elaina’s father, Terry, say they are struggling to come to terms with the tragedy. How can the family move forward after such a devastating loss? “Toledo police showed up, and they started a missing persons case,” Terry says. “Elaina was missing for about three months before Steven finally confessed,” Terry says. “Elaina’s remains were found at Steven’s parent’s house in the garage,” Terry says. “When I heard about her body being found, my heart dropped to my knees. I never thought Angela would hurt Elaina. She loved the girl,” Mary says. Angela Steinfurth maintained her innocence by entering an Alford plea. King pleaded guilty to aggravated murder. Angela was sentenced to 18 years to life, and Steven was sentenced to 25 years to life. “When I think about Elaina, I just miss her smile, her playfulness,” Terry says. 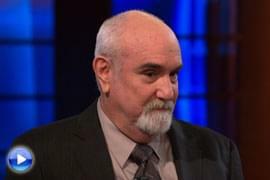 Mary tells Dr. Phil that her sister still maintains that she did not hurt her baby, but she knows that’s not true. “For them to find the blood on the wall, the bed and the floor, and then it came out that she threw Elaina, who hit the wall, the bed and the floor,” she says. Mary says her sister admitted her daughter was injured — a black eye, broken nose and a bump on her head — but never explained how baby Elaina got those injuries. How can they move forward after such a loss? And, Mary explains the tension between her and her father, who believes Angela is innocent. On Tuesday, April 8, Dr. Phil celebrates his 2000th episode with updates on some of viewers’ favorite guests! Seven years ago, April wrote Dr. Phil, desperate for one last chance to save her newlywed marriage. She weighed a frail 76 pounds on her wedding day due to her battle with a very serious eating disorder. But she says her husband, John, refused to stick around, and she had to adjust to life after divorce, while still battling her disorder. 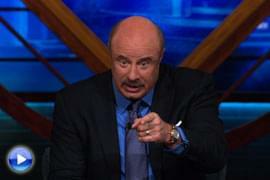 “Congratulations on all of your progress,” Dr. Phil tells her. Best Friend Killers: What Happened to Skylar Neese? Elkhart 4: Justice or Overkill?